Discover the vineyards and their history on an electric scooter at your own pace. Taste the AOC Cassis wines (4 to 5 wines) in a wine estate. From the sublime bay of the Arena, in the heart of the vineyards housed at the bottom of a calm and bucolic valley, lined with vineyards on gentle slopes, through an immense unsuspected pine forest. Departure from the port of Cassis. Ride in full moonlight and under the lights of the electric scooter, at your own pace. From the port via the valley of vineyards and pine forests to the Port-Miou peninsula. With a glass of wine in hand, admire the moonrise facing the sea and the Cap Canaille. 2 outings per month (full moon day and 1 day before or after). Duration: about 2H00 (18 kms). 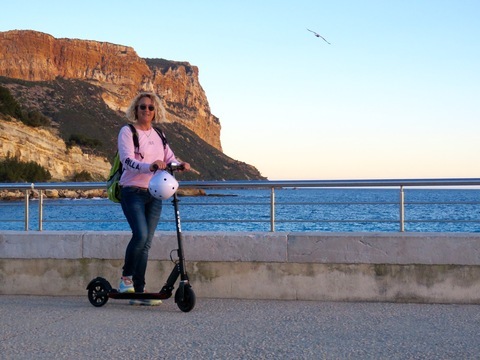 Discover the bay of La Ciotat and its history on an electric scooter at your own pace. Circuit : Port of La Ciotat, the house of shipbuilding, the beaches, the Calanque du Mugel and Street Art. Departure from the port of Cassis via the vineyards and then journey to La Ciotat by train (6 minutes). Arrival at La Ciotat station, direction "la voie douce" (cycle path and old railway track) until the beautiful calanque of Mugel via the port. Swimming break or unusual visit (shipbuilding house) or huge fresco of graffiti facing the sea (depending on the weather). Return to the SNCF station passing in front of the Eden Theatre and the beaches. Duration: about 3H30 (25 kms). Discover 2600 years of history on an electric scooter at your own pace. From the docks (former port warehouse) at MUCEM and Fort St Jean to La Major Cathedral by bicycle path, from the historic district of Le Panier (stop at the Pastis house) to Vieille Charité (17th century) to the former Hôtel Dieu (18th century). Then stop for a picnic on the Old Port with a view of Notre Dame de la Garde. Departure from the port of Cassis via the vineyards and then journey to Marseille by train or bus (20 minutes). Duration: about 4H00 (20 km).